About 500 million people speak Spanish around the world, either as native or non-native speakers, according to the North Carolina Central University website. Teaching children Spanish helps set them up to become bilingual, which is quickly becoming an important employment skill in the U.S. How you teach Spanish makes all the difference in whether kids will want to continue learning. Games can make learning Spanish more enjoyable and memorable than worksheets and verb drills. Mother May I, Red Light, Green Light and Simon Says are good games to teach vocabulary in Spanish, according to SpanglishBaby.com. For example, use “rápido” or “lento” when you play Mother May I to indicate whether a child should move quickly or slowly. Simon Says is a good way to practice body parts and giving commands. Have kids be the leader in turn so they can practice saying, “Simón dice, tócate….la mano” or “Simon says, touch your hand” or another part of the body. Dance Party is another fun game to play in Spanish. Play upbeat music, stop the music and have kids freeze. If they can count forward or backward, perhaps to 10 or by 5s, they can move. When you’re in need of a quiet game, have kids play I Spy in Spanish. This game has kids not only practicing nouns, but also adjectives and prepositions. “What’s in the box?” can be another fun way to learn Spanish. 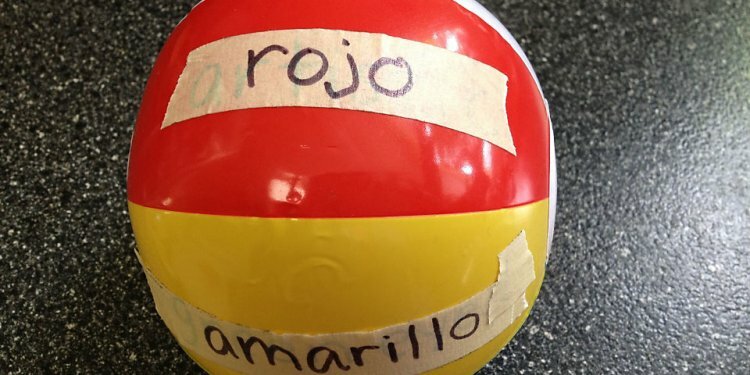 Put an object in a box, and have kids guess what it is in Spanish. Have them guess the color, the size, what it feels like, where it came from or other qualities in Spanish in addition to naming the object. The Spanish Teacher website suggests forming groups of five children, or six if they know the vosotros verb form. Line them up in straight lines, looking at the board. Say a verb in English, then the first person in each group runs to the board and writes the “yo” form of the verb in Spanish, the second person “tú, ” the third person “él / ella/ Úd, ” the fourth “nosotros, ” the fifth “ellos / ellas / Úds, ” and the sixth, if present, “vosotros.” The first team to conjugate the verb correctly wins. Matamoscas, or literally, Kill the Flies, is another game idea. Write vocabulary words children know in different places all over the board. Put students into two teams. Give a flyswatter to one person in each team. Say a word in English from the list of vocabulary you put on the board. The first person to find the word on the board and swat it gets a point for their team. Time the game, or choose a pre-determined number of words to call out so that the game has a definitive winner at the end.